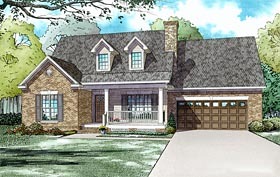 Two exterior options and a practical floor plan make this home a great choice. You'll enjoy hours of family fun in the large great room with cozy gas fireplace. The centralized dining area shows off a beautiful bay window with instant access to the kitchen, friendly grilling porch, utility room and garage. Upstairs the kids' bedrooms each have walk-in closets and their own vanity sinks to minimize bathroom disputes.